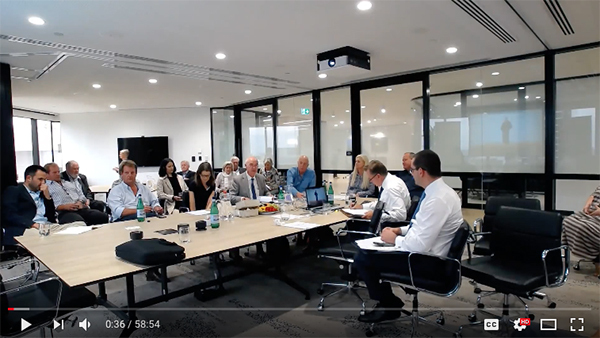 An important event held in November was our Annual General Meeting (AGM), this year held at TMI Director, Charles Cupit's, offices in North Sydney. It was very well attended with many of our members and supporters there to participate. We take our governance procedures very seriously and it was a great honour to be re-elected as a Director and Chairman. Our new Director, Diana Cavanagh, who had been appointed during the year to replace her father, Tony Coote, was also re-elected. This year we live-streamed our AGM, which you can watch online here. Amongst the visitors to the AGM was one of the Mulloon Community Landscape Rehydration Project (MCLRP) landholders, Gerry Carroll; John Troughton who has been working with Revolution Ag on some of the sensor and new technologies we continue to embrace; and Lachlan Feggans, the Sustainability Manager at Brambles. Lachlan supports our endeavours and recently also came along with his wife, Nicole, to see first-hand our work at Mulloon Creek.